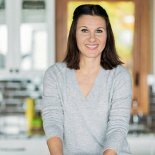 Magdalena Wszelaki shares healthy cooking tips to balance hormones.Magdalena Wszelaki learned firsthand that nutrition directly affects hormone health. Her personal battle with hyperthyroidism and Hashimoto’s disease led her to find an alternative treatment. Today’s busy lifestyle takes its toll on your health. Minimize alcohol consumption as much as possible. Skip the coffee until you have something else in your stomach. When you travel, find lodging that has a kitchen so you can prepare your own food. Stick to protein, fat and fiber for breakfast. Magdalena recommends three foods for hormonal balance. Freshly ground flaxseed. To be healthy, you need fiber to move toxins out of your bowels. Flaxseed is a natural phytoestrogen. It helps elevate estrogen. Cruciferous vegetables. Kale, collard greens, arugula, cabbage and Brussels sprouts support the liver, aiding the liver to process hormones. Three to four cups per day help eliminate hormonal issues. Liver. If you don’t like the taste of liver, you probably haven’t had it prepared well. Liver provides vitamins and minerals necessary to support hormone production. Listen as Magdalena joins Dr. Taz to share how food can help or harm your hormone health, best foods for hormonal balance, and how seed rotation works.